This was a multiple­-night Chardonnay, and that usually means one of two things: 1) either the white didn’t have enough time to breathe, or 2) the accompanying food disappeared faster than the vino. In our house, whites are consumed infrequently and even less often once the fish or chicken is gone. 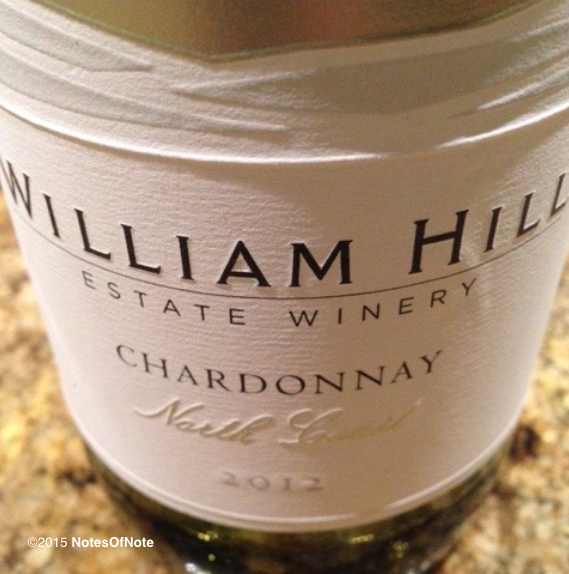 2012 North Coast Chardonnay, William Hill Estate Winery, Napa Valley, California, USA. The William Hill North Coast has good branding, and a label that is not unlike a Mondavi. The embossing is a nice touch too, but I didn’t think this white quite lived up to this appearance. It was not sweet (which gets no love whatsoever in Notes) at all, and had some light floral and citrus (definitely pear) notes to it­­–but so do practically all whites. So how did this 2012 differentiate itself? *Postscript. The winemaker described, “This well-balanced wine has a robust fruit finish.” And they also state that a “portion” of this wine is aged in stainless steel at a maximum temperature of 62°F and the rest fermented in barrels at “an ambient cellar temperature of approximately 65°F.” Bingo! This entry was posted in Chardonnay and tagged $10-$15, California, california winemaking, Napa, napa valley california, USA.